This is Chandler the Robot. He and many other creations are made by an artist and musician named Meg, once a guitarist and singer in the band Meg and Dia. This is also a photo from August 25, 2011. First week of college: brand new school, brand new city, brand new life I'd only just been introduced to. At a school of over 20,000 people, you might think there's a possibility of getting lost. That's true, but there's also an even greater possibility of meeting people who share your interests. Through my experience, I've found just that possibility to be one of the best and most lasting ways to make friends. I was spending the afternoon at the campus club and organization fair, which spanned multiple levels and wrapped every which way. Professional fraternities, honor societies, educational organizations, fun clubs, sports clubs - it was just another overwhelming aspect of how much was possible, if you chose to dive in. Thankfully, one booth was handing out free food and snacks for students who had meal plans, so I headed that way. After picking up something (probably a mini Ben and Jerry's or chips), I sat on the curb to people-watch and enjoy the atmosphere. Then I spied Chandler. You see, I own Chandler too (no, the photo in the beginning was not my own necklace). I even happen to have two: Chandler the Robot and Chandler the Explorer. On top of the fact that I was wearing my Chandler the Explorer necklace that day, not many people outside of fans of the band or indie jewelry probably knew of Chandler the Robot at the time. We both noticed each other's Chandlers at the same time, because I'm pretty sure I blurted out my excitement and the craziness of the coincidence just as she did. I for one definitely freaked out a bit. I may have even freaked her out as I asked to take a picture of her neckalce so I could send it to my mom. 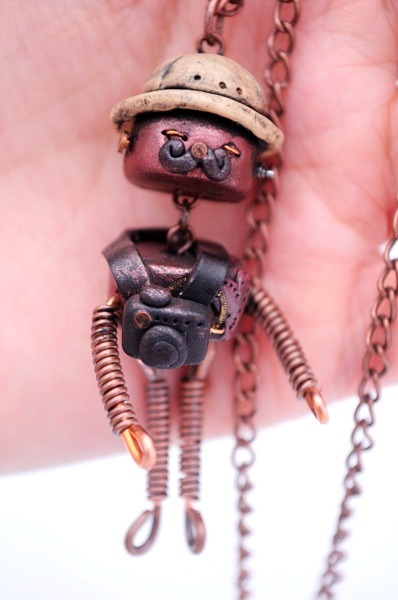 Here was someone who knew of this little copper robot, and probably one of my favorite musical groups as well. The next half hour flew by as we talked about Meg and Dia and tons of other music and TV shows and even Broadway musicals. Since I wasn't really part of theater in high school, I didn't have anyone to obsess with over my recent fascination with musicals, including the global phenomenon that is Wicked. We kept bringing up different things to see if we shared that fandom as well. We usually did. Even though we're different majors and both have pretty packed schedules, the two of us have stayed friends, keeping each other in the loop and rocking out at concerts together every semester. One of the best may be when we saw Sara Bareilles perform in San Francisco. And when I say perform, I mean bring down the house. I realize some of the friends I've made in college that I've stayed connected to the longest have been through unconventional means: saying I liked my friend's Harry Potter shirt on the first day of lab freshman year, meeting two friends in the dorm elevator and then joining them for breakfast, and more and more Harry Potter. Here's a tip - fans of Harry Potter are usually good people. So that was my August 25, 2011. Not everyone I'll call a friend one day may wear our common interests on their sleeve (or around their neck), but forging frienships should come with new discoveries. Who knows what August 25, 2014 will bring.